Arsenal will reportedly not move forward with their attempts to appoint Luis Enrique as Arsene Wenger’s successor this summer. As per BBC Sport, the Frenchman will stand down from the Gunners hotseat at the end of the season, ending a 22-year reign in north London. In turn, the all-important search for his successor is on, and Arsenal will have to get it right as it promises to be a tricky transitional period after they replace him given how long he has been at the helm. According to The Times, Enrique has seemingly been scratched off the list of candidates as the Arsenal hierarchy don’t consider him as a good fit for the club. 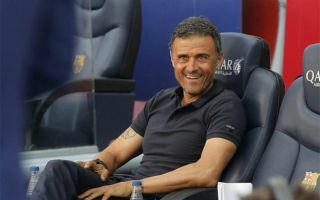 On the face of it, winning two La Liga titles and the Champions League amongst other trophies during his spell in charge at Barcelona should be all the evidence needed that he would be a success at the Emirates, but ultimately there are wide-ranging factors being considered. The report from the Times adds that Maurizio Sarri, Carlo Ancelotti and Massimiliano Allegri are three names who are still under consideration, and choosing one out of those three will be difficult, assuming that the trio are keen on taking up the challenge. Sarri’s style of football implemented at Napoli would seemingly make him a front runner, as Wenger has undoubtedly built a tradition and culture of positive football at Arsenal, something that the Italian tactician would be able to continue with his own tweaks as they’re synonymous with quick, sharp and positive passing along with high and intense pressing. However, he has yet to win another major trophies, and so from an experience perspective, perhaps Ancelotti and Allegri would be better suited. It promises to be an intriguing summer at Arsenal, as with so many options being touted, they’ll have a difficult task on their hands to get the right man for the job.